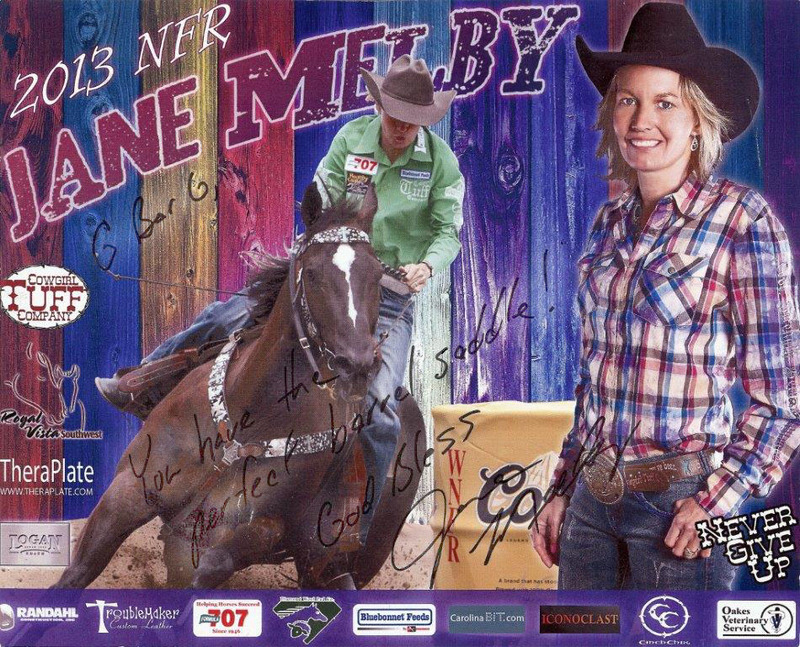 Jane Melby, http://www.janemelby.com/ WPRA National Finalist in barrel racing was helpful in designing our G Bar G barrel saddles. 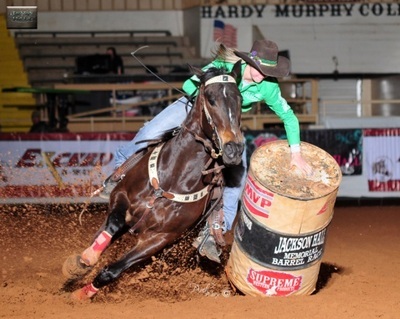 She is a superb horse trainer and barrel racing instructor. Jane is recommending these saddles now to her students at her barrel clinics. She says, "G Bar G, you have designed the perfect barrel saddle." • Placed in 5 out of 10 rounds at the Wrangler NFR. ​• 2012 - Finished the year ranked 33rd with $32,043. Won Dayton (Iowa) Championship Rodeo and Athens (Texas) MDA Rodeo. Cayla Filled her CPRA permit at the age of 15 while competing at the Canadian rodeos last spring with her mom Jane. She Won her First PRO rodeo in Brooks, Alberta Canada on RC Brooks a Streakin. Won the average at the 2014 Classic Equine Futrity in Buckeye Arizona on Dash Ta Lil and was a 2014 average champion on Wow Whata Fling at the Jackson Hall Memorial. Since I was a little girl growing up in a rodeo family. I have dreamed of making the NFR when I was 18 years old. I started my rodeo career when I was 3 years old. Going with my mom to IPRA rodeos. I thought I was entered, but really I was just an extra entertainer at the end of the barrel race. I could run a second off the fastest time on my pony. The crowd would go wild, the louder they yelled the faster I rode. When I was 8 years old I went to my first big finals. National Little Britches Rodeo Finals in Pueblo CO where I was Reserve Champion All Around Cowgirl. At 10 years of age I won the Womens All Around Cowgirl title at the Minnesota Rodeo Finals. 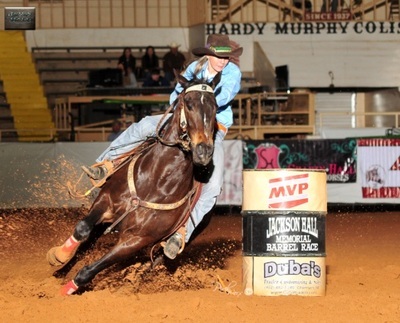 At 12 years of age I won the barrels at the National Junior High Rodeo Finals in Gallup NM. When I was 15 years old, I went with my mom to Canada, and filled my CPRA (Canadian Professional Rodeo Association) permit. It was very exciting to out run top pro cowgirls, like Mary Walker and Lisa Lockhart. After filling my permit I went back home to Oklahoma. To continue on with my dream. My plan was to train some futurity horses, and get other horses ready for the professional world of rodeo. I won the Classic Barrel Futurity in Buckeye Az to start 2014 off. Making horses and preparing myself to go back to Canada when I was 17 years old. With the goal in mind of making the CFR and ending up in the top 4 in the CPRA standings. So I would be invited to the Calgary Stampede. At the CFR I won 3 go rounds, place in 5 out of 6 goes. Was 2nd in the average and ended up Reserve Champion Canadian Barrel Racer. I also won the Permit Award and won more money at the CFR then any other rookie has ever won. Accomplishing my goal and getting to go to the Calgary Stampede in 2016. 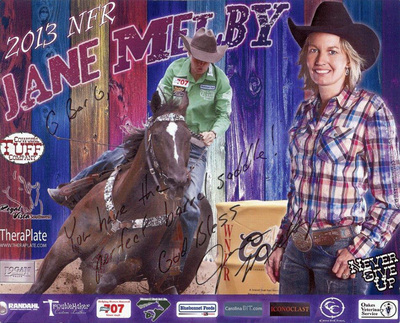 I turned 18 years old December 15th, filled my WPRA (Womens Professional Rodeo Association) permit the following weekend. I won my first WPRA sanctioned rodeo in Lafayette LA. It was a great feeling to start my career of with a win. I am looking for a few sponsors to help me achieve my goals. And in return I plan on helping you promote your business. Here are two videos of Jane and Cayla. Files are large, but well worth the download. Click on photos below of Jane and her daughter Cayla for larger views.